Rocky Fielding hopes to emulate the performance of Tyson Fury when he faces Canelo Alvarez in New York on December 15. Livepool fighter Fielding puts his WBA super middleweight world championship title on the line at Madison Square Garden against an opponent who defeated Gennady Golovkin in their second contest following a split decision the first time they met. Alvarez, who failed a doping test for clenbuterol in March and was banned for six months, is stepping up in weight for the contest. 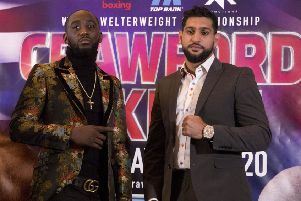 Fielding is aware of the drama surrounding Fury’s drawn heavyweight title bout with Deontay Wilder in Los Angeles and the 31-year-old hopes his performance creates just as much interest in the UK. Fielding said: “That was a big, big fight for Tyson Fury. “It’s been massive in the UK and around the world in the past couple of days and everyone has been behind him. Fielding compared his career to that of 30-year-old Fury as they both came through the amateur ranks. Fielding said: “Me and Tyson we were both in the ABA Finals together, we both went to Germany and won a world title. Fielding knows the spotlight will be on him when he faces Alvarez but will draw on his experiences after beginning his career in much humbler surroundings. He said: “I started in my pro debut in a leisure centre in front of a couple of hundred people and I just worked hard for the last eight or nine years of my professional career. I’ve had a lot of setbacks outside the ring.